I am a traditionalist foodie at heart. Nothing makes me happier than a Thanksgiving or Christmas dinner complete with all the trimmings. I love the dressing, turkey, casseroles and sweet potatoes. You name it, if it looks like it belongs on a Christmas dinner table then I’ll love it. 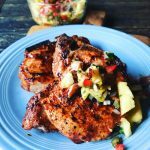 However, I’m always looking for ways to notch up the flavor on items or present traditional items in a slightly non-traditional manner. That just keeps things interesting! I usually have quite the crowd over for Holiday dinners, so I normally prepare both a turkey and a ham. 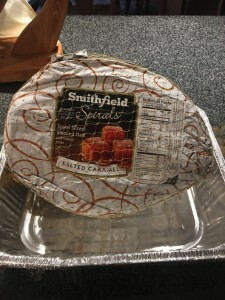 When I went grocery shopping, I noticed a new Smithfield Spiral Ham flavor- Salted Caramel! I am a sucker for salted caramel, so I quickly grabbed it to try it out. Let me tell you, it was a big hit for Thanksgiving, so I’m going to repeat the performance for Christmas. When I get spiral hams, I like to “up the flavor” some. 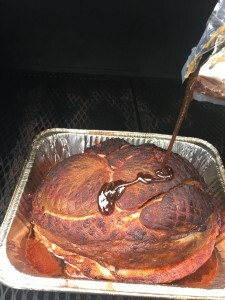 This ham would be delicious prepared just as it comes in your oven, but since I happen to have a few smokers sitting around the house, why not! 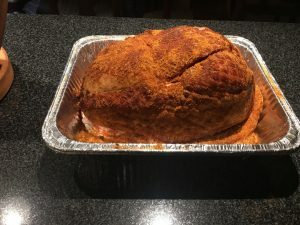 First, I unwrapped the ham and seasoned it thoroughly with my Ultimate BBQ Rub. 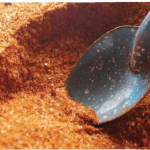 Your favorite seasoning blend would work well here as well. Next, I fired up the Jambo smoker, a barrel type smoker. 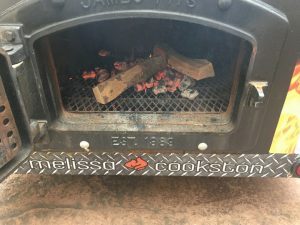 I was using the Jambo because it’s very easy to get up to temp and puts a lot of smoke on the product. I start the jambo with a base of charcoal to get the fire going, then add wood for the rest of the cooking process. With the design of the cooker, it takes a surprisingly small amount of fuel to keep the temperate at a consistent level. 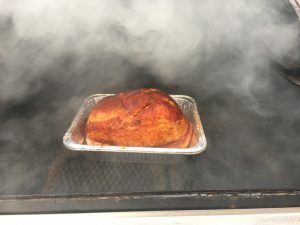 I ran the smoker at 250 degrees, feeding a small amount cherry wood about every 30 minutes. The ham was up to serving temp in about 2 hours, which happened to coincide with serving time. How fortuitous! At this point, it’s time to glaze. The Smithfield ham comes with a packet of Salted Caramel Glaze, which is muey convenient. 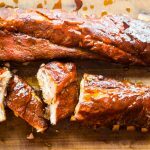 I normally make my own glaze, but I’ve never thought of making salted caramel glaze. First, I drained some (about half) of the collected juice in the pan. Then, simply cut open the pouch and pour the glaze over the ham and brush it all over using a pastry brush. 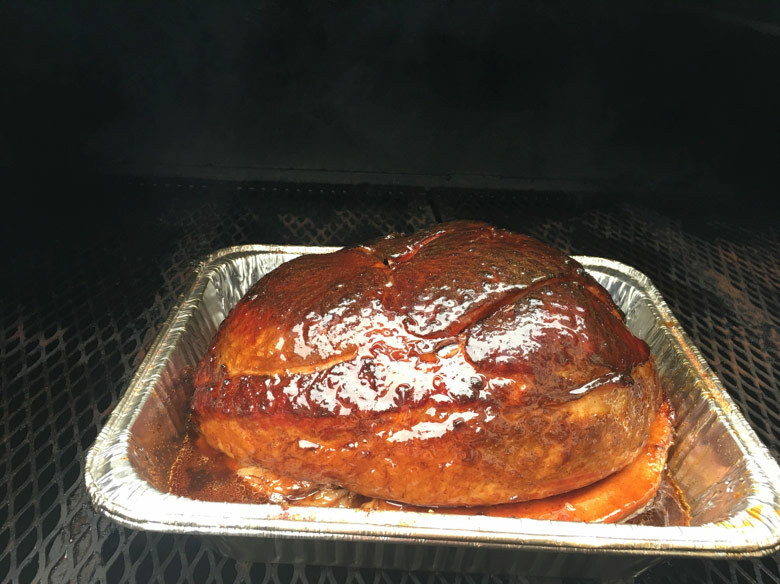 Glazes tend to pick up smoke flavor very well, and I like to “tighten” them up some, so I left the ham in the cooker for another 15 minutes. And, Voila! 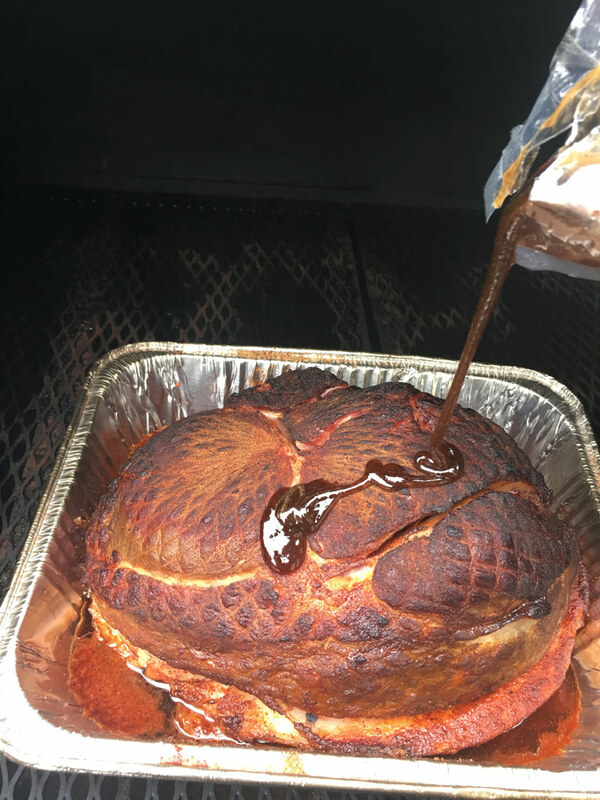 A beautiful glazed ham. It tasted better than it looked, by the way, and I thought it looked great! 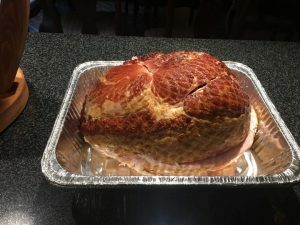 As I said earlier, this ham would have been delicious just warmed in an oven and glazed. 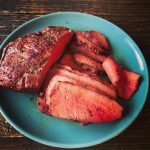 However, when you’ve had your head in a smoker for as many years as I have, a little bit of BBQ smoke and spice always seem to elevate things, so I just had to try it. Give the Smithfield Spiral Salted Caramel ham a try for your next gathering, I think you’ll be happy you did! 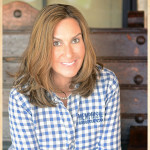 Note- I am a paid Ambassador for Smithfield foods. However, this post and the opinions contained herein are my own and are voluntary on my part.